Sculptors have to deal with the limitations of their stone. It may not be the same size or shape as their design, say. Then they must adjust the design. 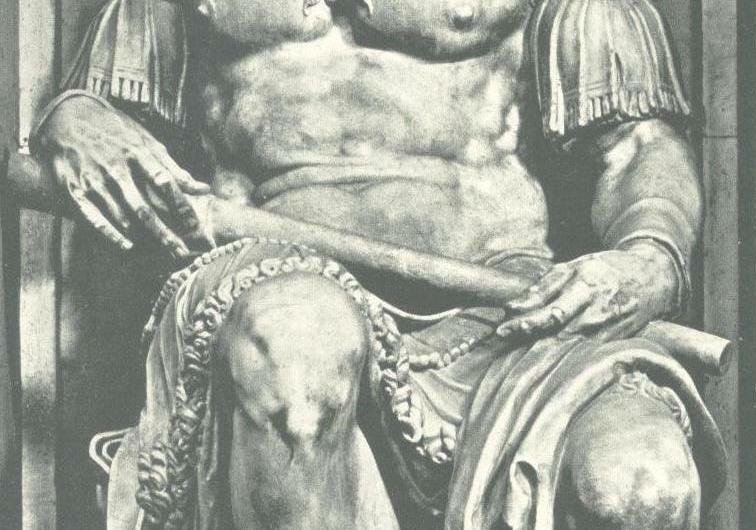 Michelangelo had to design his colossal David for a block with a hole in the middle. And what about afterwards? What about when you discover a problem after you have begun to work or, worse, after you have begun to finish? You may have chipped off a centimeter too much in a crucial place—what do you do? The rest of your face or your hand is already carved. You must invent a way out of the problem, perhaps by bending a finger that was straight or moving it over slightly if there is enough stone. There is ever so little margin. Giuliano de Medici’s staff. It is a third thicker in Giuliano’s right hand than in his left, though it was surely not meant to taper. Both hands were supposed to be resting on it and the hands were already carved. Giuliano’s left hand. There wasn’t room for all of it once enough girth was given to the staff. To make that room Michelangelo had to cut into the staff slightly. But no one sees this because, contrary to an old rule that the viewer always seeks out the defects of a figure, when the general impression is of so much power and beauty the defects do go unnoticed. Lorenzo’s base. It is “warped”. It rises to accommodate his foot. That “little” irregularity must have horrified the marblers who were in charge of decorating the chapel. The fine little slipper sole under the foot was also cut there to help explain some of the excess stone. 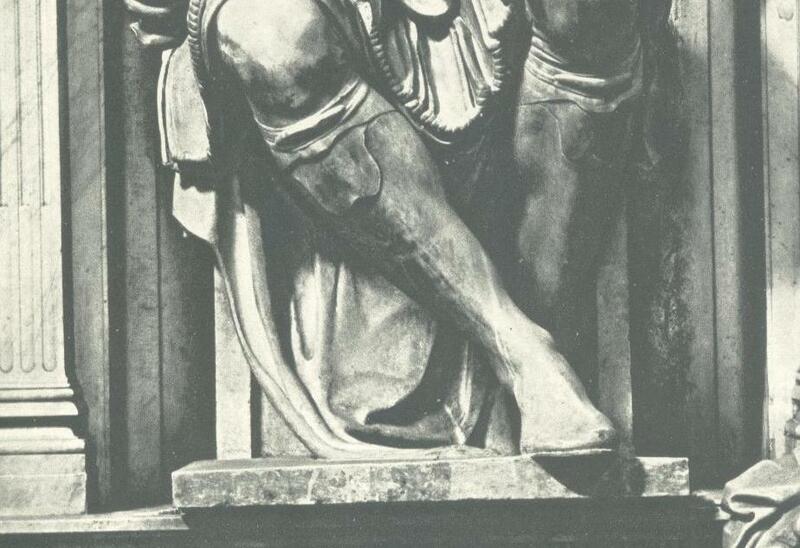 A similar problem showed up when Michelangelo came to Giuliano’s base: his left foot came down higher on the base than his right. To “solve” this, Michelangelo had to fool the eye by sloping the whole base from back to front; and then, since the plinth (base) was still a little too thick in front, he removed some marble from the bottom side (not visible in my picture–sorry), so the statue “floats” half a centimeter off the floor of the niche. 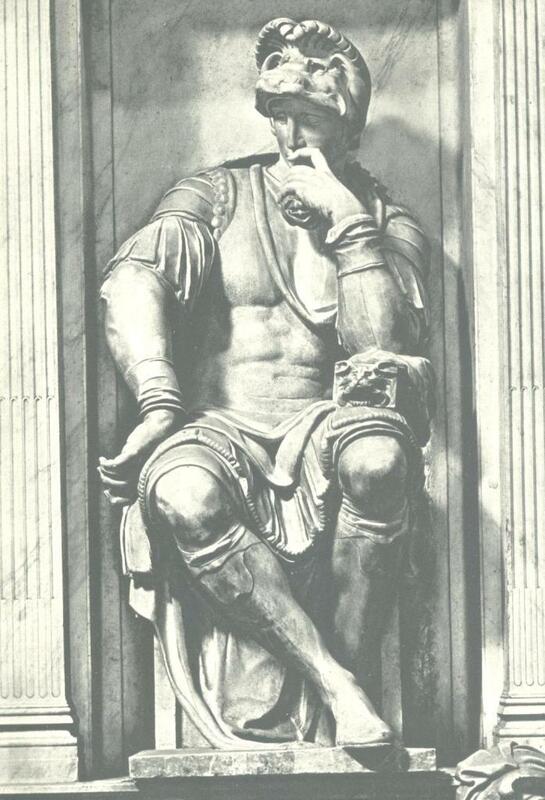 This entry was posted in aesthetics, art, art history, great artists, Medici tomb, Michelangelo, Renaissance, sculpture and tagged aesthetic problems, inventing, Michelangelo, sculpture, stone carving, thinker. Bookmark the permalink. I found your discussion of cutting the stone, realizing you’ve made a mistake, and then re-sculpting in your mind a way to work with what you have left, really interesting. I never would have thought about this complication in sculpting, if you had not especially pointed it out. I have another question for you. Living in Spain, have you ever heard of an artist named José Perrimon? I have several of his books (apparently translated from Spanish into English) and I have found him such a good teacher in how clearly he explains things and gives great examples, step by step. I was just wondering if you’d heard of him. See, G, why I stay with the painting?! I just googled Parramon IParramon it is!) and got plenty of links…. Thanks, Danu, for looking up the Parramon for Madame Monet. I know some of those books and guessed who she meant. I read them long, long ago and am surprised to see they are still around and translated into English. It’s true the author is very entertaining. I wonder if he is so entertaining that many prefer to read him than to take out the paints and the brush and get down to work, which is the best teacher. I’d like to recommend the best book I know for beginners on sculpture: SCULPTURE: PRINCIPLES AND PRACTICE by Louis Slobodkin. It was written years ago but is full of information and help. The author is both a good writer and a good sculptor. So, Madame Monet, Danu beat me to the draw. I saw right away that you probably meant José Parramón. I remember his method, in spite of his lively style, as pretty conventional–what with the long introduction on color theory, for instance. I would have dumped that or put it at the back of the book so as not to bore beginners who want to get right down to work. But he’s good and very clear, it’s true. But no one sees this because, contrary to an old rule that the viewer always seeks out the defects of a figure, when the general impression is of so much power and beauty the defects do go unnoticed. I was thinking of this recently as I looked at one of my own watercolors. I know what is wrong with it, what can never be fixed due to the medium(lost white paper is to the watercolorist what missing marble is to the sculptor). And I know the workaround that I used. It was the best I could do. But I have to hope that most viewers will never see the defects. Art is seen by many people. Most will never notice the defects. But for the viewers that count most in a way, those who are really familiar with the art, whether it is marble sculpture or watercolor painting, you just hope that these viewers will say: clever solution! I think this applies to only the best artists! Well the part about ‘general impression is of so much power and beauty the defects go unnoticed’ I’m sure applies only to art that has that amount of power and beauty, which is found only with the best artists. But, sad to say, most viewers spend less that 5-10 seconds looking at art works in the flesh. That’s been my experience in both galleries and museums. It’s a sad fact for an artist to acknowledge. Most viewers really don’t look at your work. For those types of viewers I think that the defects are missed because they haven’t seen enough to make an evaluation one way or the other. For viewers who look more closely, and obviously have some appreciation for art, then you can only hope that whatever compromises you have made to cover defects in your art, will not be too noticeable, or that maybe the viewer will say: it looks like they ran into a problem here. Then they might say: 1) they should have just stopped and given up on this work, or 2) clever solution. My guess it that with the examples here that most viewers, if they even see the defect, choose number 2. Ken: Don’t you think the spotting of defects has to do with your (one’s) confidence in the artist? If he looks like he knows what he is doing, you see the extravagance or the odd detail and try to “understand” it—to see what he meant by it, even if you don’t like it. A great artistic personality forces the viewer to accept his whole presentation or leave it. Pointing out obvious shortcomings in the great endeavor just makes you a quibbler. You couldn’t be more correct about that Swallows! I’ve found it very rare among my friends and acquaintances for them to accept a criticism of someone who is famous. There seems to come a point of fame where any criticism is absolutely a sign of bad taste, sour grapes or some other fault of the critic. I expect this with people who don’t understand the medium well but I’ve also found it true to a large extent with fellow artists. I’m not sure that a great artistic personality forces the viewer to accept his whole presentation. If you’ve come to the conclusion that he/she is a ‘great artistic personality’ through your own honest appreciation of the artist then I think that’s true. You’ve become such a believer in the ability and artistry of the artist that you think ‘he did this deliberately. I wonder why.’ Sometimes you never know. But I think it’s less true if you don’t personally believe in the greatness of the artist. That’s certainly true about galleries and museums, Ken, but realistically, as a viewer, you have to make some choices in a museum packed with artwork. Most pieces get seconds of the viewer’s attention, a few dozen less thean a minute, only a select few get full attention. What’s bothering me though, usually the most famous works get all the attention, while others, just as great, but not as well-known are routinely passed by the general public. That so many works, especially the non-famous ones, are routinely passed by bothers me as well. But I think as artists we just have to be realistic and say: that is the way it is. Not many people will really stop and look at a work of art and get something out of it. I also think that this hold true whether you’re in a museum, where people tend toward the famous works of art, or in a gallery, especially a juried show, where there are no famous works of art. In both cases the majority of viewers spend very little time looking. I think my estimate of 5-10 seconds is actually very optimistic. I don’t blame the viewers for this. I’m not sure why, maybe it’s just the time we live in. I’ve accepted it for years and known that the work I do and I think the work of most artists, alive and dead, will only be really appreciated by a few. I don’t like this and I’m not an elitist, saying that art is only for the knowledgeable. I just think that art for whatever reason isn’t given much time by most viewers. But I also think that if people, even very unknowledgeable ones, live with art they come to a greater appreciation of it. This happened to me with some secretaries when I was in graduate school. I had no expectation at all of them liking my large abstract work that hung for awhile near their desks. But they did and I think it was really just because they saw it every day. So I do have great hope for more people appreciating art. But I don’t think it comes through ‘education.’ In fact I’m a great unbeliever in art education. From what I can see people really do have an innate love for art, just as most do for music. But it’s best developed not by someone telling them ‘this means that and that means this because of some other thing’, but instead by living with it. I know I’m off on a lengthy tangent here but I’ve gone so far I might as well continue. If I were a museum I’d remove all signs except ones naming the artist, medium and date. I’d get rid of tapes, videos, docents and whatever else gets in the way of the viewer actually looking at the art. My feeling is that if people went into museums and had no guidance whatsoever they’d eventually gravitate towards something that they liked and start looking at it. From there they’d eventually develop their own personal appreciation of art, and they’d begin to look more closely at all art, famous or not. If an artist is skilled enough or famous enough many will think the flaws were intentional. They expect the master can make no errors. I agree with much of your thoughts, Ken. People constantly try to define what art is, but I don’t think they will ever agree or succeed at it. It’s something that has always been there with us, for us, something unnecessary and necessary at the same time. I remember seeing a photo some time ago about a Rodin exhibit somewhere in the Far East I think, with two young people sitting next to The Thinker and imitating his gesture with big smiles on their face. That’s the power of art. And this reminds me of more photos from the new wing of the Art Institute in Chicago, where visitors crowd around the title of a sculpture, and I presume some words from the artist, instead of looking at the sculpture, a giant log, a beautifully textured form. Another picture shows visitors admiring the striking skyline of the city in the rooftop sculpture garden,virtually everyone ignoring the sculptures. True, some of the sculptures look rather functional, so they sit on them. I agree, it’s very important to provide an environment where there’s nothing that competes or retracts from focusing on the artwork itself. 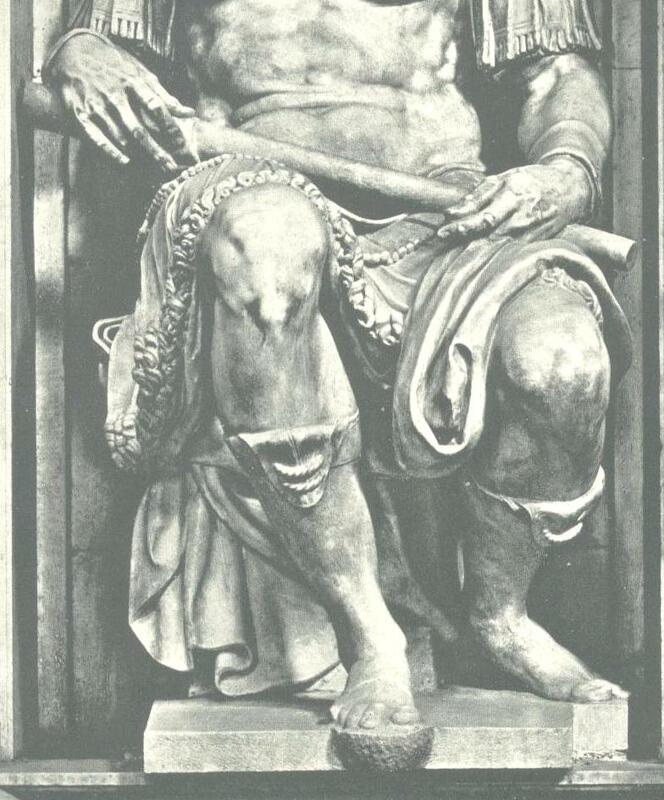 Whenever I look at Michelangelo’s sculpture of Guiliano de Medici, I can’t help feel badly for him. I see a head and neck that don’t fit the body. First off, the sternocleidomastoid is much too long. given the body type, this man would have a short stocky neck. The body is frontal yet the head is seen in profile, odd, but the head is too narrow. If this piece was slid out of its recess I think the head and neck issues would be even more apparent. Thanks, Daniel, I see what you mean. Michelangelo decided anatomical correctness had to defer to the grace of that elongated neck. It boils down to his aesthetic judgment vs. yours. I disagree. He is not known for the grace of his long lines. Except for Mary, his figures are strong, bulky figures, especially the men, whom he portrays as men of strength, for him to defer for the sake of beauty is generous of you. It’s not graceful; it’s painfully out of scale and awkward looking.